Looking for a discount on your next new or used vehicle? A credit card issued by a bank associated with the car or even motorcycle manufacturer may be the answer for you. Whether it’s new or used, you could save up to thousands of dollars on your next purchase of a vehicle. Which credit card is right for you depends on your own personal tastes. Besides the reward points or whatever they are labeled, other features such as extended warranties, sweepstakes, concierge services, custom cards, built-in accident insurance, introductory low APRs can be just as important, if not even more in determining your selection. The Toyota Rewards VISA offers a hefty 5 points per $1 spent at participating Toyota dealerships, 2 points per $1 spent on gas, dining and entertainment, and 1 point per $1 spent everywhere else that VISA is accepted. New account holders receive 5,000 bonus points when they spend $500 outside Toyota dealerships within first 90 days. Redeem the Toyota Rewards Points on services and purchases at your Toyota dealer of choice. Together with its no annual fee, this is the credit card for the loyal Toyota customer. BMW gives their VISA cardholders points for dollar spent at BMW motor centers, which depend on which card level they are approved for. Points can be applied towards maintenance and other services provided by BMW dealers. Charge $500 on a new Harley-Davidson® Visa® in the first 60 days and get $150 in H-D gift cards. Because eligible purchases get 0% financing for 12 months, the buyer can spread out the minimum payments over a year at no cost. Card holders may even earn up to 3 reward points on H-D stuff, 2 points at gas stations, lodging, restaurants, and 1 point any where Visa is accepted. Chase Bank replaced the Subaru Platinum MasterCard with special financing and leasing options on new Subaru vehicles. A card worthy of the Lexus nameplate, it rewards new cardholders 5,000 bonus points upon charging $500 outside Lexus dealerships within first 90 days, 5 points per $1 spent at Lexus dealerships, 2 points per $1 spent on gas, dining and entertainment purchases, and 1 point per $1 spent everywhere else Visa is accepted. Points can redeemed on Lexus products, cash back as a statement credit, gift cards to select merchants, or for travel experiences. The no-annual fee card includes Visa’s signature service package with concierge-type assistance and numerous other personal touches befitting the Lexus lifestyle. 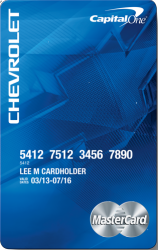 With a new Chrysler DrivePlus card earn a $100 statement credit with your first purchase, 0% intro APR for 6 billing cycles ($499 minimum spend), 5 points per $1 spent at FCA dealerships, 2 points per $1 spent on gas & travel, and 1 point per $1 spent everywhere else Mastercard is accepted. When you charge $7,500 in your first year you will receive $1,000 bonus certificate towards the purchase of your next FCA vehicle. See program guidelines for details. The Mini Visa card allows users to customize their credit cards to look exactly like their own Mini. For a limited time when new account holders charge at least $2,000 within the first 90 days, they receive 30,000 bonus MINI Motoring Rewards Points. Those purchases can even be financed at 0% APR for up to 15 months by paying the minimum due every month. In addition card users get one point per every dollar spent and a bonus point on car washes, gasoline, tolls, and items at MINI dealerships. This card is issued by CapitalOne and you can make purchases up to your credit limit and pay NO interest charge for the first 12 months, as long as you pay the minimum balance each month. You get a hefty 5% earnings on the first $5,000 in purchases and 2% Earnings on all other purchases for the rest of the year. However the points can not be be redeemed for cash, but only on purchases of an eligible GM vehicle. Honda discontinued its co-branded credit card program. Honda still offers financing for its vehicles through its Honda Financial Services division. Credit cards might be useful for other purchases at Honda rather than financing a new vehicle.